August is going to be our month of cycling! Take the kids cycling to our favourite local bike shack (Stan's Bike Shack). There are plenty of these popping up all over the UK. The best thing is you get to enjoy a much deserved coffee, kids get cake and the whole family has done some exercise! Take the kids cycling along the seafront! Ice-creams for everyone and sticking to the bike path means no traffic (my 4 year old still seems to think that cars will stop for him...). Teach the kids how to mend a puncture (a handy life skill to learn). Check out the guide on page 16 of My Book of Bike Activities. Wash ALL the bikes - perfect when the sun is out. And hey, you can't beat a water fight after a long bike ride. Download the Bike Chain Mandala from our website to colour in on those inevitable rainy days. Get the kids to design their own bikes - make a model or draw one. Find out some interesting cycling or bike related facts, use our book or the web. Spot cycling signs and symbols when out and about. Download the poster - Know Your Bike from our website to teach the kids parts of their bike. Make our own bike streamers. Create a cycling obstacle course in our driveway. Play Bike Tightrope - Draw a line that is about 3 inches wide and 50 feet long on the pavement with chalk, challenge the children to ride the 'tightrope' keeping both wheels of their bike on the line. If you come up with any alternative ideas to add to my list please feel free to comment below. 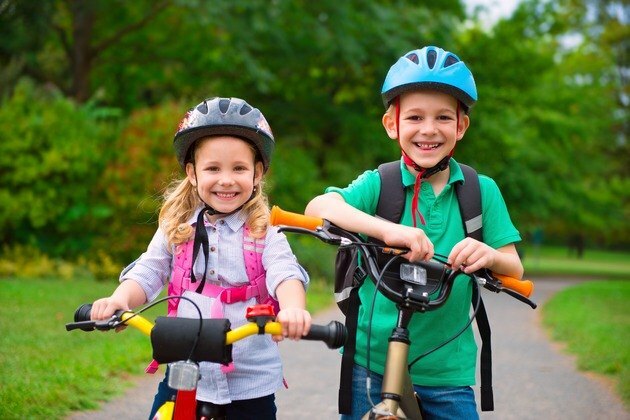 For some great advice or family cycling inspiration visit Sustrans. Hopefully this will be enough to get me through August!